GasisturnedonHistoricdayforAugusta - Summit Utilities Inc.
Gas is turned on. Historic day for Augusta. Natural gas is now flowing to Cony High School, making the city of Augusta the first Summit Natural Gas of Maine customer to receive natural gas service as part of the company’s planned $460 million investment to construct natural gas infrastructure in the state. In the next few weeks, hundreds of more businesses and thousands of residential customers will have access to natural gas. The city of Augusta contracted with Summit Natural Gas of Maine in September to reduce energy costs at 17 city buildings including City Center, fire stations, the Augusta Civic Center and six schools, including Cony High School. 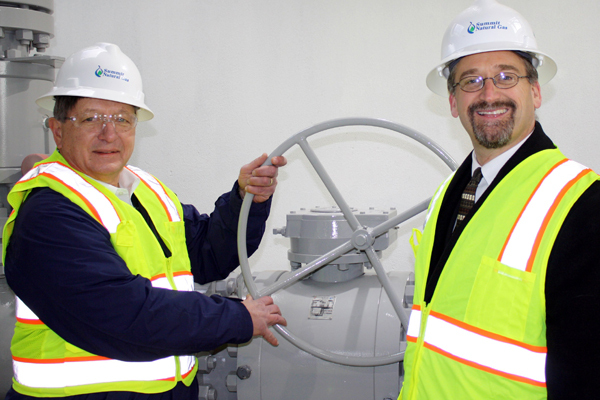 Switching to natural gas service is expected to save Augusta $641,464 annually. Summit has installed 23 miles of steel and plastic pipelines in the city that will reach residential and commercial customers. More than 1,600 business and residential customers across the Kennebec Valley region have already signed contracts with Summit to save on their heating costs and use a more versatile and environmentally-friendly energy source. Commercial and municipal customers that have signed contracts with Summit include the city of Augusta, Huhtamaki, Inland Hospital, Mattson Development, Redington-Fairview General Hospital, Sappi Fine Paper North America, Thomas College and UPM Madison. During the past seven months, more than 800 construction workers have helped build out the first phase of Summit’s Kennebec Valley totaling 68 miles of steel main pipeline from Pittston to Madison and 32 miles of distribution pipeline in communities in Gardiner, Randolph, Hallowell, Augusta, Waterville, Fairfield and Madison. Future expansions that will eventually reach businesses and residents in 13 additional towns and cities in the region. In the next few weeks, businesses and residents in Augusta, Gardiner and Hallowell will be able to save on their heating costs by switching to natural gas. Hundreds more residents throughout the Kennebec Valley have signed up with Summit for natural gas service to benefit from the best efficiency rebates available and save up to 50 percent on their heating costs. In 2014, Summit is investing in additional infrastructure to serve more communities in the Kennebec Valley and beyond as well as Cumberland, Falmouth and Yarmouth. Based on demand, the company is developing their construction schedule and build-out for early spring. Businesses and residents should contact the Summit Natural Gas of Maine office in Augusta to request natural gas service. To learn more about service areas and the construction project, call 855-353-4433 or visit www.summitnaturalgasmaine.com. Summit Utilities, Inc., the parent company of Summit Natural Gas of Maine, operates 20 natural gas districts throughout Colorado and Missouri, and specializes in providing natural gas to areas that are either hard to serve or that aren’t being served. These districts represent approximately 40,000 customers, $292 million in assets, 400 miles of high-pressure steel main lines and approximately 1,500 miles of polyethylene main lines.